Physics is one area that should be immune to the sentiment of, “When am I going to use this?” Yet I’ve heard this voiced in my class and to be fair I doubt many of my former students have ever needed to determine the flight time of a projectile launched in a vacuum or the speed of a hoop rolling down a ramp in their careers. 3D printing gives you the opportunity to either create or help your students create equipment to address engaging problems that go beyond the textbook. These problems might be the subject of national news or maybe just viral videos. In this presentation, I will share projects done by and with my students that benefited from the inclusion of 3D printing. For years my goto CAD solution for designing parts to be 3D printed has been Tinkercad. It really is the fastest way to get students designing their own 3D parts. The basics of Tinkercad can be taught with less than five minutes of instruction. Best of all, it is totally free and you don’t need admin rights to install any software.. The basic idea is that you create objects by combining primitives and then using other primitives to create holes or take away materials. The other thing to know is that once a shape has been added you can stretch or squish it in the x, y, or z dimension or rotate it around the x, y, or z axis. Using this very simple paradigm you really can create some very complex objects. Creation of these objects often involves a lot of critical thinking and problem solving for students to figure out the best way to get to their desired final part. Below is my take on the Spill-Not. A similar product is sold by science suppliers as the Greek Waiter’s Tray. This was created totally in Tinkercad in less than ten minutes. You can find my version on the Thingiverse. You can easily modify my version to suit what ever cup you might have. It currently will accommodate a standard coffee cup. To play with my design goto: https://tinkercad.com/things/i02pOyl5X81 and click on “Tinker this” (you must be signed in to Tinkercad first). Then click on Ungroup to reveal the underlying shapes. You might need to do this multiple times to see all the shapes. The order in which you group things has a huge effect on your final design. A “Cylinder” (orange) as the base with a squished “Torus thin” (red) to make a lip to keep something from sliding off. A “Torus” (green) to swing it by. This was placed above the center of the base floating in space. It is important that this be centered above the base at the desired height. Then group it with the base so it will stay centered. A “Torus Thin” (blue) was stretched and then rotated slightly to attach the base to the ring. “Box” holes were used to remove the un-needed bits. A stretched “Half Sphere” was tacked on to the flat surface of the half torus in order to make the ring attachment more attractive. This is can’t be seen in the picture below. Over the last several months I’ve been spending a lot of time thinking about 3D printing and learning. This was spurred on by the #MakerEDChallenge2 on the Thingiverse. The basic goal was to either create new designs that could be used as projects in an educational setting or to re-purpose old designs. In either case you were supposed to include a lesson description that goes with your thing. Some of my entries were brand new things, but many were not. I realized that almost all of the things I’ve posted to the Thingiverse were created for some educational purpose. Many of these were for student centered labs or projects. However, I’ve only done a couple projects where I’ve had students designing and printing their own things (Wind Turbines, Phone Holder). So I thought about how I could turn some of my other designs into student centered 3D design projects and got a couple more entries together (Solve a Problem, Create a Device to Teach Physics). Then I had a realization. Not all projects that involve a 3D printer need to be 3D printing projects. This revelation reminded me of TPACK. TPACK is Technological, Pedagogical, and Content Knowledge. One of the main take aways is that we, in education, often look for ways to “Integrate Technology” into the curriculum. At best, this is sloppy thinking. At worst it can lead to lower outcomes. TPACK offers a different way of thinking. For me, TPACK starts with the idea of Pedagogical Content Knowledge. The idea behind PCK is that it is important to know the best techniques to use to teach your particular content. Basically, different ways of teaching will be better suited for different types of content. This seems obvious, but we often seem to forget it. Specific pedagogies work better for specific content. I wouldn’t, for example, teach my electronics class the same way I teach physics. The content has some overlap, but all in all it is different enough that my entire approach needs to be different in each course in order to be maximally effective. Never ask the question, “How can I incorporate a 3D printer into my curriculum?” Instead you should think about, “What is possible now that a 3D pinter is in my classroom?” The distinction is subtle, but it is also powerful. Many years ago I saw a really cool apparatus invented by Steve Rea, a local physics teacher, for experimenting with concepts of rotational motion. It was a simple system of stacked pulleys of decreasing diameters. Metal rods with weights allowed the moment of inertia to be easily varied. The device was elegant in its simplicity and offered the opportunity for incredibly rich investigations and discussions. As it turns out, Steve’s brother owns Arbor Scientific. Arbor adopted Steve’s design and they now sell it. Arbor’s Rotational Inertia Demonstrator works amazingly well and is very repeatable. I highly recommend it. At $160 cost really is quite reasonable for such a well built piece of lab equipment. When I saw it for the first time I wondered aloud if I might be able to 3D print one. Steve told me I would have difficulty reproducing it because it was nearly impossible to find bearings that lacked grease. Grease is added to bearings to protect the metal bits from corrosion and increase the life of the bearing in high load/high speed operation. The viscosity of the grease in most bearings is too high for this sort of application. It would not allow for a good transfer of gravitational energy to rotational energy. 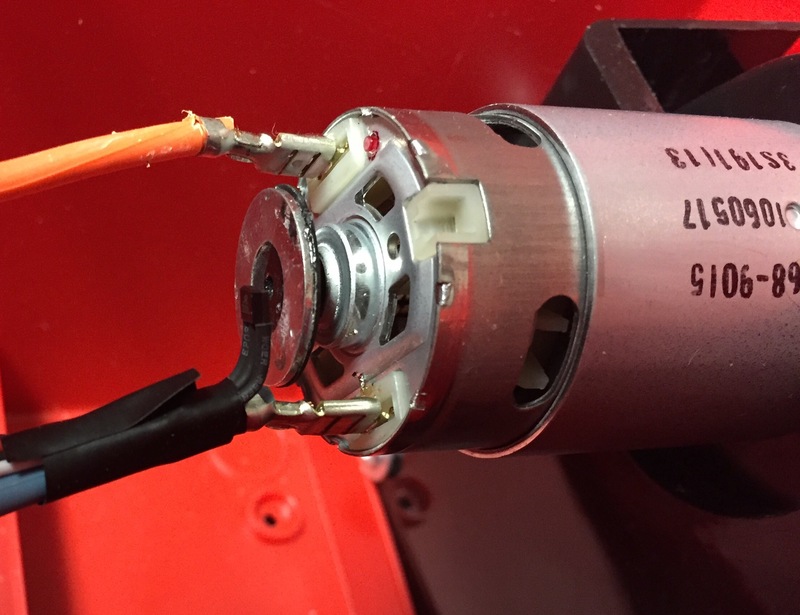 Steve told me the hardest part of creating his prototype was finding suitable bearings. At the time I wasn’t interested enough to try to source acceptable bearings so I let the idea lay fallow. Then, last year, the fidget spinner craze happened. Several months ago I was having a conversation about 3D printing with Andy Mann. He told me how his son designs and prints his own fidget spinners. Andy also related how his son is so into this he found a YouTube video showing him how to degrease his bearings to make them spin longer. It took a day for the light bulb to turn on. Two days after that I had a set of bearings from Amazon (I love Prime) and my prototype of a 3D printed fidget spinner. I started with this to make sure the degreasing worked and that I had dialed in the perfect size to hold the bearing. With that done I knocked out a quick prototype, which failed utterly. Two versions later and I had it done. You can find my design on the Thingiverse and if you’re interested you can tweak it however you’d like in Tinkercad. 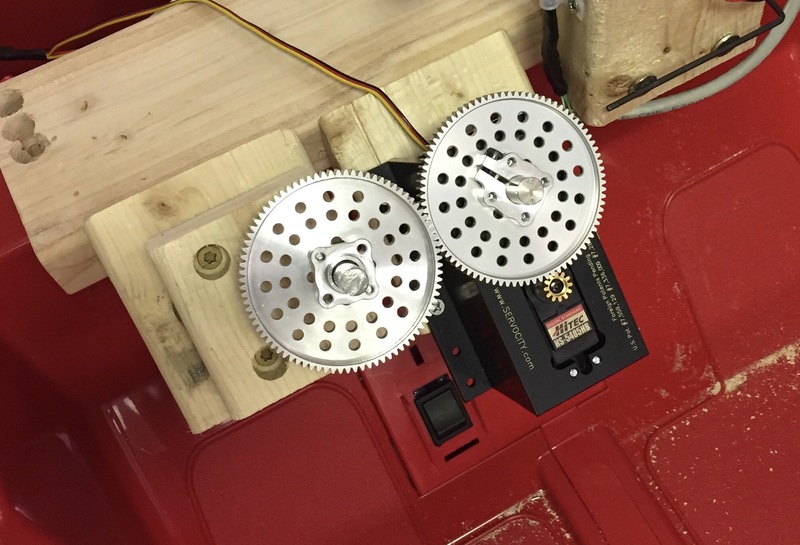 There are three different pulleys to provide different amounts of torque. With an extra set of hex nuts the washers can be positioned different distances from the center of rotation changing the moment of inertia. There are a lot of experiments that students can do to investigate rotational motion and the transfer of energy. As I mentioned above, the bearings need to be de-greased first. The grease protects the bearings from water and road grit, but it will keep the bearings from spinning freely. I used acetone since we had it in the chemistry supplies. I just dropped them in a small beaker for 20-30 minutes. I found I also had to take them out of the acetone and spin them a couple of times then drop them back in. A lot of the instructions on the net direct you to remove the metal shields. I’ve found you don’t need to do this. However, if you get “sealed” bearings you will need to remove the seals. You need two bearings, one in each end, for full support. If you want to avoid using acetone do a little googeling for other ways to de-grease bearings. There’s lots of stuff related to fidget spinners kicking around right now. I’ve been teaching a semester long electronics class every semester since I started teaching in 2000. It started as a basic circuits course, but several years ago I started teaching it with the Arduino micro-controller platform. It has undergone several transformations over the years and I’m changing it yet again this semester. We’re starting with some basic circuit fundamentals. In the past I assumed they would learn these fundamentals as we worked with Arduino. It turns out I was wrong. One of the circuit building things we did this week involved making paper circuits. This worked out really well and gave students a chance to discover differences between series and parallel circuits. They also got to do some trouble shooting to figure out closed, open, and short circuits. All in all it was a fun project to help set the tone for the semester while also giving us an activity we can refer back to as we move forward. We have a new chemistry teacher this year. At his old school he used these conductivity meters from Flinn Scientific. He said they work really well. He had students use them to make qualitative comparisons of the conductivity of different solutions. The only problem I saw was their price tag. They are $22 ea. This is not horrible, but there really isn’t much to them. So I decided to see if I could make them cheaper. Turns out it was pretty easy to source the components to place the cost at no more than $1.50 ea. So, for the price of one of Flinn’s meters I can make a classroom set. I used Plasq’s ComicLife to create this. I’d forgotten how much I enjoy using this for making tutorials.